First time you do something, it requires a lot of brain power. But, the more you do it.. the less you have to think about it. Challenge yourself for new thinking and automate kindness, efficiency, and impact. The brain works on queue (trigger), routine (what to do to get to..), the reward. After you figure out the habits, you can fiddle with the gears for better results. Parenting – It’s not about your child becoming a musician when you sign them up for piano lessons. It’s giving them the chance.. err.. forcing your children to to practice and improve. It exercises ability to use will power and become better. Will power is a muscle. It must be exercised Similar to have the will power to work out after work – great practice. I decided to get inspired during my drive into Mariposa/Yosemite and listened to John Muir on my way there. Muir’s enthusiasm and excitement to be in the mountains, with solitude and emerged in the beauty built an appreciation for me to take a moment and take it all in. Muir has the uncanny ability to understand the science and art working together. He’s had an in-depth understanding. 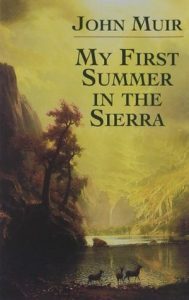 Muir’s appreciation and descriptive writing of the Sierra plants and animals is inspiring. He defines the ability to be in the moment and appreciate the inner workings of mother nature. The audiobook was at times dense, which could balanced the spirituality of nature, the science of pine trees, with a small story of him helping coordinate the sheep flock to safety among bears, starvation, and getting lost. I listened to this book on my way back from Yosemite. It was a beautiful spring day, while I rode through the back roads of single lane highways, window down, sun shining as a I sped through the greenery to get home and saw a few California Condors on the way. Pretty awesome. However this book makes you stop and think about human nature or the nature of power. The farm animals revolt and win. Then the pigs start to take leadership with Snowball and Napoleon. “All animals are equal”Snowball teaches the animals to read and write, while Napoleon educates young puppies on the principles of Animalism. Food is plentiful, and the farm runs smoothly. Some time later, several men attack Animal Farm. When Snowball announces his plans to modernize the farm by building a windmill, Napoleon has his dogs chase Snowball away and declares himself leader.Napoleon then becomes more powerful. Squealer becomes his right hand propoganda. Mr Frederick, a neighbouring farmer, attacks the farm, using blasting powder to blow up the restored windmill. Although the animals win the battle, they do so at great cost, as many, including Boxer, the workhorse, are wounded. Despite his injuries, Boxer continues working harder and harder, until he collapses while working on the windmill. Boxer collapses from working too hard and rumors surface that he’s sent to the glue factory.Years pass, and the windmill is rebuilt along with construction of another windmill, which makes the farm a good amount of income. The pigs start to resemble humans, as they walk upright, carry whips, and wear clothes. The Seven Commandments are abridged to a single phrase: “All animals are equal but some animals are more equal than others. 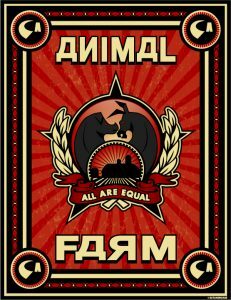 My way of saying it… Farm thinks humans are bad, so there’s a revolution and the new society creates a government where all is created equal. Seven rules provide governance. Through constant changes, constant tweaks, constant power grabs… the pigs then continue to get more powerful through deceit and corruption until finally they are the exact replica of the humans – they take the money, they live in the house and sleep in the beds, they stand on two legs, they drink, they kill, they lie… they do everything the humans will do to keep power. Interesting on playing into perception. Snowball, the adversary to Napoleon, becomes the villain. Beforehand, he was the hero. However, he opposes Napoleon despite both being pigs. He comes up with the ideas, supports education, and Napoleon finds a way to rid him with his dogs. Then he continues to make up stories on Snowball, who is the “so-called” villain. This helps unite the people. Sadly, many worlds create Snowball. Trump creates many “Snowball”s. Good people, but no in the perception of power. Hard working Boxer supports the people in power. He continues to work. Then he works harder. He gets injured and wants to work harder. Then the love that Napoleon provides… after Boxer collapses… he sends him to a horse mortuary to become glue for profit. All the hard work… means nothing. I think we can all feel taht way. 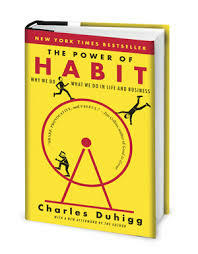 Great book that really makes you humble on how human kind can operate at times. What an incredible story about man’s ability to survive. I was left in awe on what’s possible. 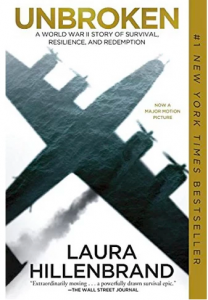 Louis Zamperini was born to run – initially from causing juvenile trouble, but then he went to compete in the Olympics, and eventually coming close to breaking the 4 minute mile. He then gets pulled away from the war. He goes on an incredible run with his bomber having 500+ bullets in it. However, his plane goes down on a search/rescue mission. He’s 1 of 3 who survive. From there, his journey takes him to being a POW for the next years. He routinely is then beaten, degraded, and beaten again by “The Bird” Watanabe who later becomes one of the most wanted war criminals for his mistreatment. Finally the war had ceased, and Louis got back home. He eventually met his wife, but also met alcoholism. Louis fell hard and deep into drinking. This is how he escaped his dreams about The Bird and POW camp. He would black out on a regular basis. Enough was enough, and his wife filed for divorce, but then had one last ray of hope. His wife forcibly took him to go to a seminar with Billy Graham, an Evangelican Christian. From this seminar, he then recalled his promises he made when on the sea to God. He had mentioned that if he could get water, he would be faithful forever. His dreams of The Bird quickly then vanished. WIth this, Louis gave up drinking and then began to tell his story. He turned around his life again and saved his marriage. He then would die in his 90s. Louis had such control though over his mind. While he was drifting in the sea, he would continually challenge the other two survivors with trivia, making recipes, telling stories, etc. He figured the brain was a muscle that must continually grow. And by doing this, he could help avoid going crazy.